NASA has just released new high-resolution videos of the event recorded by the Solar Dynamics Observatory (SDO). The videos are large, typically 50 MB to 100 MB, but worth the wait to download. SDO also detected a shadowy shock wave issuing from the blast site. 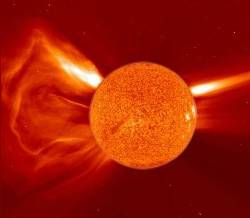 The ‘solar tSunami’ propagated more than halfway across the Sun, visibly shaking filaments and loops of magnetism en route. This entry was posted in 2012, ancient text, asteroids, astrology, astronomy, comets, cycle 24, earth changes, earth’s core, earthchangesmedia, earthquakes, extreme weather, floods, galactic center, galaxy, hopi prophecy, hurricanes, lunar-eclipse, mayan, mayan prophecy, mitch battros, pole shift, science, solar storm, solar_flares, solar_system, space, space weather, sun-earth-connection, sunspots, tsunami, Uncategorized, universe, volcanoes, weather and tagged 2012, ancient text, ancient wisdom, charged particles, coronal mass ejection, cycle 24, earth changes, earthchangesmedia, earthquakes, extreme weather, mitch battros, solar storms, solarstorms, space. Bookmark the permalink.